The Purple Pinkie Nail Salon: We're Ready For Halloween! 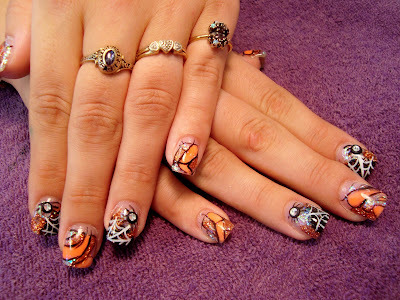 Check out Sara's Spook-Tacular nails! These were completed with colored acrylic, glitter acrylic, hand painted accents and topped off with a couple of Candy Drop Spiders! Come let us make you Spook-Tacular in October! !